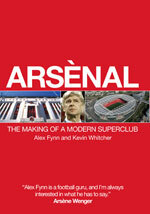 Alex Fynn is a well-known consultant to the football industry who has also written In this presentation, drawing on material from his recently published book Arsènal: the Making of a Modern Superclub (co-authored with Kevin Whitcher), Alex will examine the critical role of Arsènal team manager Arsène Wenger in not only team affairs – building one of the most exciting young attacking teams in European football through a strong emphasis on youth talent development with a globalised reach – but also through his involvement as a key influencer on the evolution of wider business strategy at the club – in 2007/2008 Arsènal was the 3rd richest club in the world, had successfully managed the transition to possibly the most impressive club stadium in European football at the Emirates, all whilst remaining profitable at the pre-tax level, an extraordinary achievement for a European football organisation. Critically he will address the key questions; to what extent does Arsène Wenger’s philosophy represent a genuine and sustainable break with past management practice and if it does, to what extent is it generalisable as best practice at other clubs?extensively on the subject of the football business. His clients have included Arsènal, Celtic, Manchester United and Tottenham Hotspur football teams, as well as the Football League and the Football Association. Through his work he has been influential in the formation of both the Premier League and the European Champions League. Previously Alex was a director of the well-known advertising agency Saatchi & Saatchi, latterly as vice-chairman. Throughout his career Alex has acted as an advisor on the negotiation of the sale of TV broadcasting rights for clients such as the Football League and the FA, the latter which led to the award of the first BSkyB television contract. He has advised a number of clubs and federations on media and marketing; including the sale of broadcasting rights by the Polish FA, Galatasaray of Turkey and most recently by Celtic, Blackburn Rovers, Bolton Wanderers and West Ham. Fynn, A. & Whitcher, K. (2008). Arsènal: The Making of a Modern Superclub. Vision Sports Publishing.